A chameleon does not look much like this…. The reason I was keen to see reptiles was a preoccupation I’ve had lately with chameleons, or rather the idea of a chameleon – as in the drawing at the top of this post, which doesn’t look very much like one. They have the ability to change colour according to mood or condition in order to signal this state of affairs to other chameleons and it’s this that I’d been thinking is such a handy device. I wish I could do it, or something like it, because it would be so useful. My physical and mental state varies from week to week, day to day, minute by minute. The condition I live with (ME) means that I’m never feeling fully well, or at least very rarely and only fleetingly for a few minutes at a time. Mostly I’m on one of about three different levels of un-wellness and I tend to stay on the same level for weeks and sometimes months at a time, but I slide up and down between these levels on a daily, hourly and sometimes momentary basis just to add variety to the mix. Definately a Green day, overall – but with early outbreaks of Blue shading to a tendency towards Orange in the late afternoon….. It would be so useful to be able to colour code these changing conditions and broadcast them, in a subtle but demonstrable way. I present as a confusingly erratic presence (or absence) because it’s hard for other people to get a handle on what’s going on. It’s sometimes hard for me to get a handle on it for that matter. I think of blue as the largely absent state of perfect wellness (happily I do get to experience this in a transient way once in a while, and it’s extraordinarily, gloriously wonderful) and the next level down would be green, which is my highest level and which I call Restricted But Reliable. The next level is yellow, More Restricted, Unreliable. After that comes orange, where I’m basically Poorly, Largely Unavailable; and the bottom level would be red, where thankfully I’ve been only rarely and for short periods, but it would be called something like Completely Unable, Count Me Out. 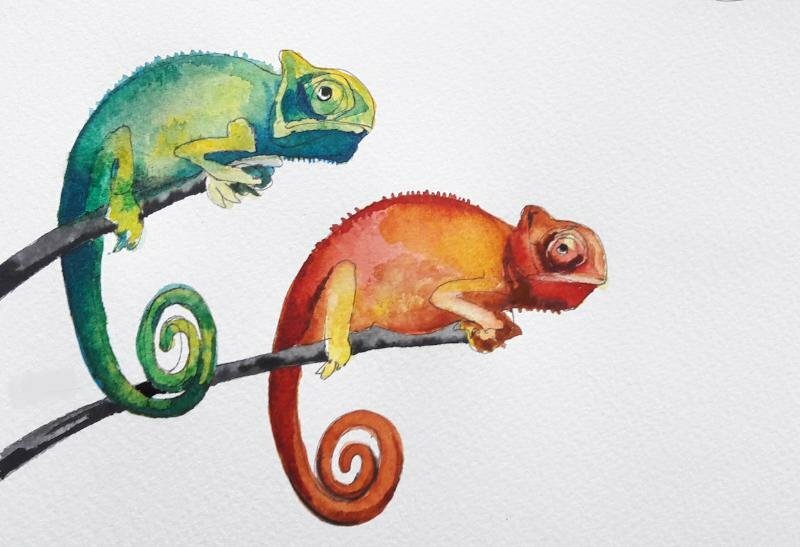 I don’t know much about chameleons but they seem to be able to change colour rapidly as their situation dictates, and this is how my signalling system would ideally work – and so as long as my colours were understandable to others this would seem like a very handy tool. I wonder if anyone’s tried this, or something like it…….? 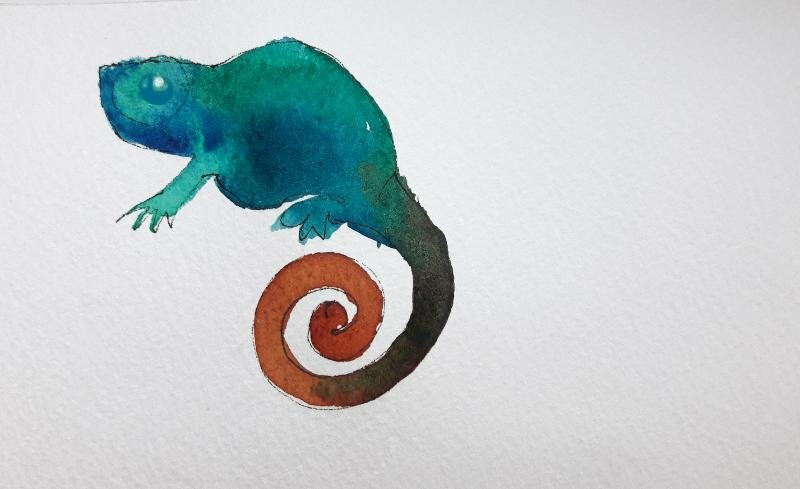 Chameleons that are still imaginary but look a bit more like chameleons…. I plan to do some dedicated sketching up at the animal houses soon, and even though there are no reptiles or spiders (except very tiny ones, mostly hiding) I can’t wait to renew my friendship with the rabbits and guinea-pigs, and I’m looking forward to meeting some new animals that that I understand have arrived, which I’ve heard about but never seen. Watch this space!